Who are biggest climate offenders? 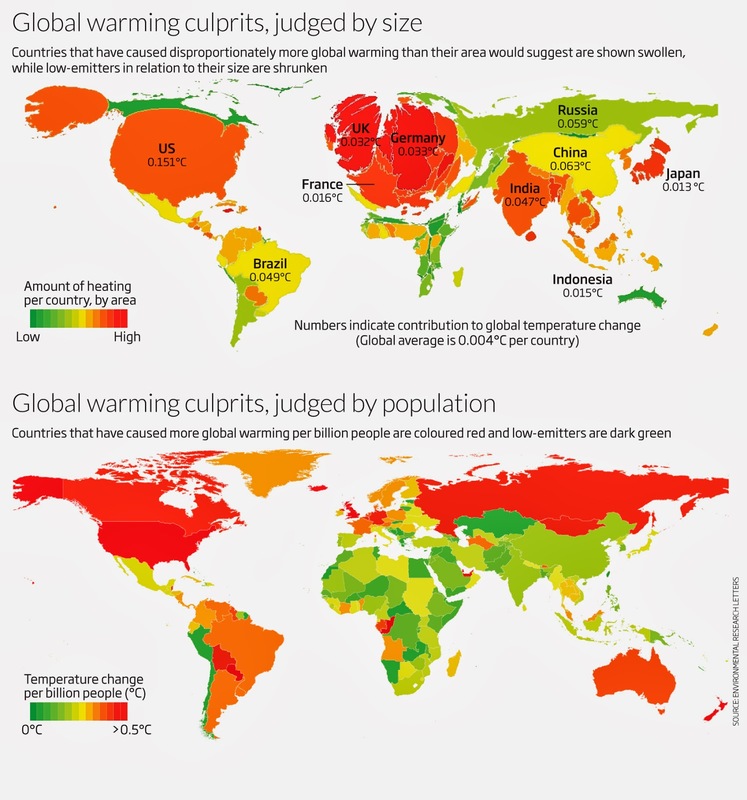 The picture on the right is a representation made by the new scientist of the biggest climate offenders by country size and population based on a 2014 study. Skipping the debate about the way scientists managed to compute contributions to global warming by country, one HAS to react about the top representation: contribution to global warming judged by country size. How can this map be taken seriously? No wonder Australia (a big desert) is faring so well while densely populated countries perform poorly. The second map is more interesting and clearly identifies the western lifestyle (and industry) as well as deforesting countries as the principal culprit to global warming. Some additional food for your thoughts: most countries import their goods from China. Where do you think the author counted the emission caused by the production of these goods? Another important caveat is that our national climate contribution estimates account only for emissions produced within a given country, and not the transfer of emissions associated with the international trade of products and resources. There is an emerging body of literature which has shown that a consumption-based representation of CO2 emissions leads to a shift in the allocation of current emissions from major producer countries such as China towards major consumer countries in North America and Western Europe (Davis and Caldeira 2010, Peters et al 2011, 2012). As a consequence, a substantial portion of recent emissions from developing countries could be equally allocated to the developed countries that consume the goods produced. The same could be argued for emissions associated with agriculture and resource extraction; it remains an open question as to whether these emissions should be allocated to the country of production or extraction, or to the country of ultimate consumption of the food or resource in question. Quote from National contributions to observed global warming, by Damon Matthews of Concordia University in Montreal, Canada.